Rich's Tool of choice -- a #00 Flathead Philips Precision Screwdriver (to pry the LCD from the unit). You must first remove the control buttons on the bottom of the LCD. 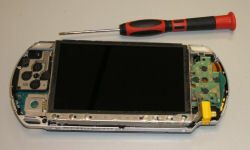 Then Pry the lower left of the LCD out of the PSP. 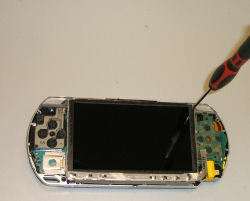 Lift the LCD from the PSP by pulling the top downward as shown in this picture. To remove the LCD completely, GENTLY pry/lift this clip up so the LCD ribbon slides out. 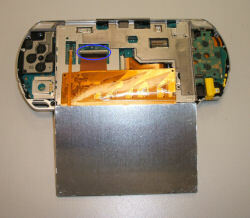 Be careful as this part is fragile and if you damage it, your PSP is pretty much useless. The backlight ribbon just pulls out of the motherboard connector. YOU MUST PULL GENTLY!!! Do Not Tug on any cables in the PSP. The backlight and LCD are shows as one unit. 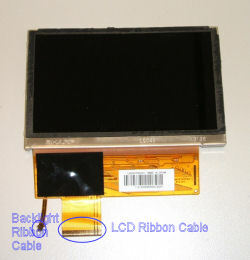 The backlight's ribbon is shown on the left, the LCD on the right. Re-Install the LCD by reversing the directions above!